Sheldon Cooper became a college student at 11 and had a Ph.D. by the time he was 16, but apparently, as a 30-something, working on two science projects at the same time breaks him. Remember last week, when I said I couldn’t imagine how the Big Bang writers were going to get two more seasons’ worth of stories out of this show? Right now it’s tough to imagine getting through the four more episodes needed to close out this season. Everyone’s gonna have to have babies, get married, get divorced, change careers, and buy houses, and that’s just to make sure there are enough milestone episodes. The rest of seasons 11 and 12, sadly, may consist of filler like this installment. So, the show broke Sheldon. It happens because he agrees to work with Leonard and Howard on the quantum guidance system project, and with Amy on their quantum perception project, both on the same day. Amy and Leonard think this is weird, and while they each seem to be asserting a claim on Sheldon’s time, Raj reminds them that Sheldon’s attention is actually a prize they’re competing for. Sheldon assures his BFF and his girlfriend there’s plenty of him to go around, and seems to be proving it by zipping back and forth between two labs, making significant contributions to both projects. But despite his backpack full of sustenance — water and lentil soup are being fed to him via drinking tubes — he inevitably gets worn down by all the collaborating. A few sneezes later, he ingests cold meds, and many hours after that, he wakes up on the couch in his old apartment, missing his pants and underwear, a notebook full of top-secret government info tied to the gyroscope project, and any memory of what he had done earlier in the day. Raj suggests tracking Sheldon’s movements throughout the day using his cell phone, and it works. They learn that, while hopped-up on the pharmaceuticals, Sheldon made his way to a cowboy bar, where he line-danced, befriended the bartender, and shared classified government intel with the rest of the bar patrons. Fortunately, when they take Sheldon to the bar to confirm his earlier activity, they find that notebook. He’s relieved, for it means he won’t have to go to prison, where he understands guys like him are often made to become the tutors of larger men. His pants and underwear, meanwhile? In the microwave and a pot on the stove, respectively, in Leonard and Penny’s apartment. Elsewhere, Bernadette is having mixed feelings about returning to work after her maternity leave. It’s a more real-world story line than Sheldon’s Sudafed-sparked line-dancing adventure, but this particular take on the new-mom trope manages to offer nothing new: She’s torn between career and motherhood. She is both excited for more adult interaction and guilty about time away from the baby. As for papa Howard, his story takes us back to the land of ridiculous sitcom contrivances. It’s revealed that six years ago, he forgot to give Bernadette a phone message about the death of her great-aunt, Trixie. And instead of ‘fessing up anytime since, he sends his wife Christmas cards from Trixie, every year, once going so far as to include $5 in the card … a $5 bill that was lifted from Bernadette’s purse. Has she never attempted to speak to this aunt during all these years? Has she never sent Trixie a Christmas card, only to have it returned, because Trixie is, ya know, dead? Has no one else in her family ever mentioned Trixie, thus alerting Bernie to her deadness? Am I just expecting too much to not have to consider such questions about a show that’s been around way too long to leave such sloppy plot holes? 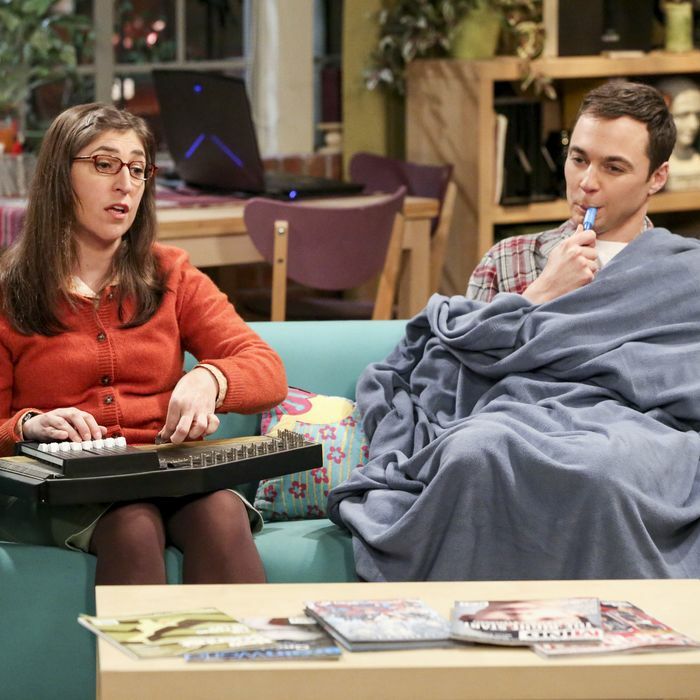 • Highlight of the episode: Because Sheldon is sick, he requests the one thing that always makes him feel better when he’s under the weather: a performance of “Soft Kitty.” Most impressive: Amy Farrah Fowler can sing the tune in English, German, and Mandarin — all while playing the zither. • The onset of Sheldon’s cold should not have come as a surprise, according to Penny: His delicate constitution also led him to catch a cold when he watched Frozen and get a nosebleed when he saw Up.